Students build a band by dragging and dropping artists to the stage. Last night I was answering a request for best practices in interactive teaching and learning from Adobe, I stumbled on an NPR interview where one of my games became the focus! Hear the interview. Teaching Naked focuses on moving teaching technology out of the classroom to spend quality face-face time where it counts, essentially inverting the traditional approach to teaching. Dr. Jose Bowen, argues that you can use technology in effective ways to first introduce students to material before they reach the classroom. So when students do get into class they can spend the time debating, discussing and exploring. Dr. Bowen discusses why he provides his lectures as podcasts and uses Flash based games to engage his students. 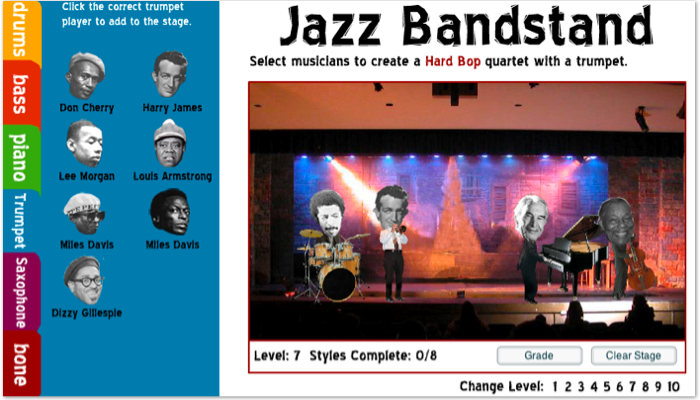 In the interview, the host of the program plays Jazz Bandstand, one of the games I designed for his Jazz History students when he taught the large attendance class at Miami University. In the game, the students build a jazz band to match the requested jazz style. It’s a whimsical but effective way of moving students from simply memorizing who played what, to analyzing differences in individual playing styles. The activity kicked off a large series of successful activities and learning games I designed for the Fine Arts faculty and teaching staff at Miami. See more in the Game Category.